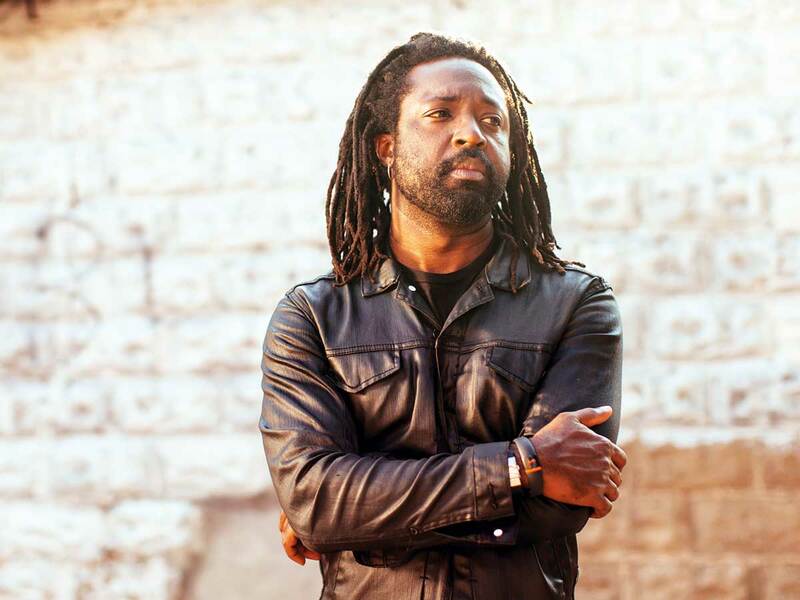 It’s two days before the US release of Marlon James’s much-hyped fourth novel, Black Leopard, Red Wolf and the prizewinning Jamaican author has an air of baffled, exhausted ebullience about him. He’s no stranger to critical success: he won the 2015 Man Booker prize for his violent, multi-voiced epic, A Brief History of Seven Killings. But it feels like this new book will propel James into a new galaxy of literary stardom. We’ve arranged to have lunch at the Commodore, a carefully shabby Williamsburg diner near his Brooklyn apartment. Brawnily broad-shouldered, his dreadlocked hair tied back in a ponytail, James has arrived before me. We’re shown to seats at the bar where low winter sun slants through the blinds on to the bar top. James tells me it feels like summer to him — he spends much of his time teaching creative writing at Macalester College in Minnesota — and as if to prove it asks the waiter for an Aperol spritz. We order and I pull out my tattered proof of the book. I’ve read it twice already, I tell him, and love it as much as any book I’ve read for a long time. James’s UK publisher, he says, was worried that it would be “too literary for fantasy fans, too fantastical for literary fans”. But the best novels defy the narrow clannishness of genre labels and Black Leopard…is one of them. It’s complex, lyrical, moving and furiously gripping. The critics, whose panegyrics have been appearing over recent weeks, seem to agree. It was while at the advertising agency that James found himself drawn into a local evangelical church. Alongside a ready-made community, it seemed to offer a means of dealing with the fact that it was becoming increasingly clear to James, who’d lived a monkish life thus far, that he was gay. He described in horrifying detail in a recent New Yorker article how he underwent exorcism at the church. It was during this traumatic time, though, that he wrote John Crow’s Devil, his lowering Faulknerian debut, which tells of two rival priests, each with a guilty sexual secret to hide, competing for primacy in a fictional Jamaican village in the 1950s. It’s a fabulous book, dark and angry and experimental, every page bearing traces of the linguistic daring and visionary imagination that would later characterise James’s work. He left the church and sent his novel out to a selection of New York agents. When the first handful said no, he sent it to more, and more, and more, 78 in all. Each of them rejected it. “I remember that somebody said it was the subject matter – that nobody wants to read about the Caribbean, that it was because it was super dark, because there are no white people in it. At that time, dark had to be couched in a certain way. It had to be The Lovely Bones. It had to have a redemptive narrative. I think we’re still in a place where we want a white person to play a part, even in a black story. I briefly toyed with putting my [white] friend Gerard’s picture in my biog and sending the book back out,” he says with a laugh. In the end, James’s novel was read by an American author, Kaylie Jones, who passed it on to the indie press Akashic Books in New York. John Crow’s Devil was published to a warm critical reception in 2005. The narrative from here is often painted as an inexorable rise to literary stardom, but James reminds me that his second novel, The Book of Night Women, a brutal 18th-century slave narrative that takes place on a Jamaican sugar plantation, was also turned down almost 20 times, before being picked up by Riverhead Books and published in 2009.